The egg is a very nutritive food source used in baking for a variety of functions. An egg is a source of nutritional and functional protein from chicken. Humans have been using eggs as food since the beginning of time. Ancient Egyptians and Romans were the first to use domesticated chicken eggs for baking. They recognized eggs’ potential to thicken or bind other ingredients and their use evolved from this discovery. In baking, eggs perform many functions (like acting as emulsifiers) that help bakers eliminate the need to use other additives. Those functions include the ability to add color, coagulate, emulsify and add texture to bakery foods. The use of eggs help simplify the product label. Eggs, particularly egg whites, have high quality proteins that produce superior foams. Through whipping, eggs foam and incorporate air, which gives volume and structure to bakery foods. Foaming holds bakery foods together and promotes a lighter product with smooth mouthfeel. Eggs produce a larger foam volume than other foaming agents, making it ideal for baking. This is especially ideal for cakes, such as angel food cake, because the aeration provides necessary structure. In brioche bread, egg provides a good structure for a bread that is springy. There are certainly many more functionalities of egg in baking. However, its usage is limited in the commercial bakery because it is one of the top allergens in North America. An egg is a very nutritive food source. Its high protein profile, together with the presence of essential vitamins and minerals like Omega 3, makes it a perfect candidate for healthy baking. To replace fresh eggs in a formula, use 26% egg powder/74% water ratio. Therefore, every 100g of whole eggs need to be replaced by 26g of whole egg powder and 74g of water. Liquid – Egg that is often available for commercial kitchen use. It is separated, homogenized, pasteurized, enhanced, refrigerated or frozen. 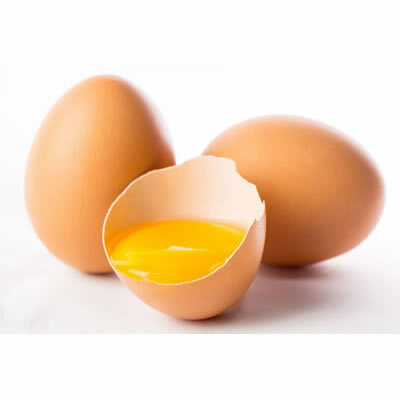 Dry – Egg that is separated, enhanced, blended; Dry eggs are most common in commercial baking due to their ease of dispensing, extended shelf life and stability at room temperature.